Hey kids, it’s time to learn an ever important lesson about wildlife. 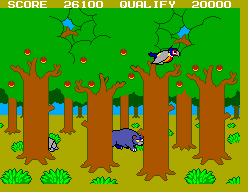 This game does what Duck Hunt did but much better, with much more animals, and a kickin’ opening theme. Your goal, and ultimately reason for existance is to shoot everything that moves. If it’s cute, you shoot it. If it’s illegal, you shoot it. And if it’s endangered, yes, you’ll be shooting that too. 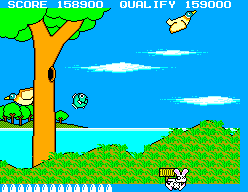 In this game, getting our forest friends better acquainted with lead produces effects such as blasting the flesh off of fish, shaving bears bald, rendering bats flightless and castrating sly little rabbits, each met with comedic results. Yes, you read that right. Killing animals is funny. Some will tell you this game is cruel, which should be met immediately with the air tight response “it’s just a game”. You’ll win every argument with these four words (three and a contraction of two, technically), and everyone knows your manliness is measured by your ability to be argumentative, especially on the internet where said manliness is already on the line (precede this phrase with a “that’s your opinion” for the one-two KO). As you feel your interest waning, you begin to think “just a little more, this might be the last level”.By level 50 you start to realize that final level ain’t comin’, but the real agenda becomes clear, and by now you’ve already sold yourself to it. 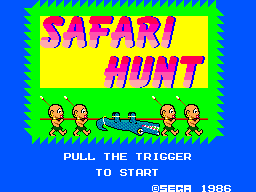 Safari Hunt is not just a game, it’s 69 intense rounds of the same three levels, sharpening your precision and your discernment. And when you’ve proven yourself, the game awards you with a license to kill, something that was common in 1986. That’s right kids. Your determination to shoot imaginary bears gives you the right to grab whatever firearms you happen to possess and show the world what you’re made of. For instance, what of that raccoon that’s constantly knocking over your trash that YOU have to clean up? What about the neighbor’s cat that won’t shut the heck up at 2:00 in the morning? Or that nasty hive? There must be, like, a gazillion points worth the hornets inside. Afterall, now you’re competing for high scores in real life, and you don’t want to look like a punk. More so. Just be sure to keep a printout of your license at all times, or you might end up looking like an idiot.